Do you want to get away from it all? Come to this small farmhouse in the heart of the Audomarois marshes. In this scenery between land and water, let happiness wash over you. Find refuge on a UNESCO world heritage listed island. Where is it? San Francisco? Venice? Bamako? Not even close! It’s at the heart of the Audomarois marshes, a land of waterways and market gardens. To get there, leave your car at the quay. Muriel the owner comes to fetch her guests by boat. Does that sound like fun? Good, because you get to use the boat for your excursions during your stay. It’s an island, remember. On arrival, the hens cluck excitedly when they see you disembark, while the grey heron observes the scene from the corner of his eye. Welcome to this little natural paradise and to the charming little house, which was a boat-builder’s carpentry workshop in a previous life. The rooms are decorated in a chintzy, cosy style, perfect for a romantic weekend. The countryside atmosphere is everywhere. Flowers, greenery, water… what more could you ask? A boat is at your disposal, so you can explore the labyrinth of 160 km of watringues (small canals) that criss-cross the 3,400 hectares of Audomarois marshes. You’ll be given a detailed map of these magical places… and you might even see Marie Grouette, the witch who haunts this area. But don’t worry, she’s not wicked at all… Muriel knows her well! 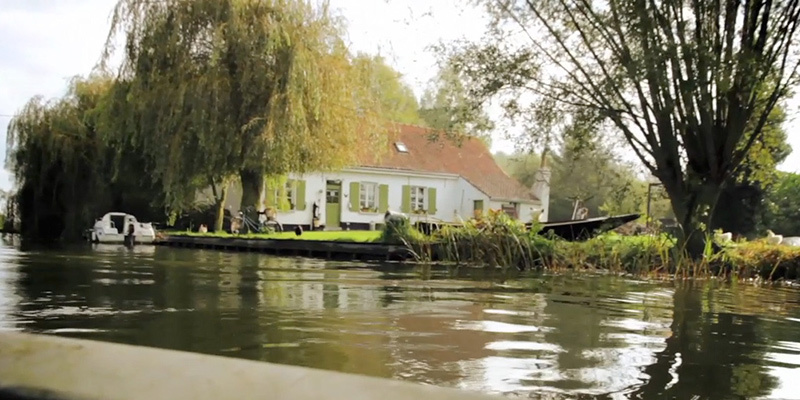 The next day, hop into the boat with a guide and explore the canals of this incredible universe, the Audomarois marshes.